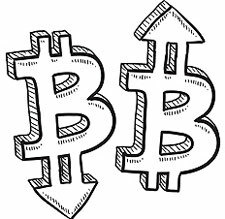 Does bitcoin need a standardized three-character symbol? Only if it has a future as a tradeable instrument with a physical spot market and a robust derivatives market. I argue that bitcoin does indeed have such a future. The news that Bloomberg was testing a bitcoin price ticker with code XBT on its worldwide platform gave a boost to the effort for including bitcoin in the ISO 4217 list of currency codes. The Geneva-based International Standards Organization is an international standard-setting body composed of representatives from various national standards organizations. ISO 4217 is the standard list of currency codes used in banking and business globally. SIX Interbank Clearing in Zurich maintains the ongoing discussion and management of these currency codes. Although not necessary for market adoption, as the Bloomberg testing demonstrates, recognition of a bitcoin code by a market-based standards organization such as ISO would set the stage for increasing market depth and liquidity of bitcoin trading. That in turn would tend to reduce volatility and lead to some basic risk management and hedging strategies for merchants that accept bitcoin and maintain some balances in bitcoin (rather than immediately converting to a national fiat currency). Additionally, the enhanced trading liquidity provides more reliable outlets for exchanging bitcoin thereby facilitating overall consumer and merchant adoption. A lower court ruling in Texas recently declared that bitcoin is a "currency or form of money." This ruling is interesting because it highlights the fact that bitcoin is gradually becoming recognized as commodity money in the same way that gold and silver are. A commodity money classification is appropriate for bitcoin because ISO already recognizes the precious metals. Early indications are that bitcoin will soon be included in this 4217 standard under code symbol XBT. It is unlikely bitcoin would be listed under the abbreviation popular among its users, BTC. That’s because in the ISO standard, the first two alpha characters represent the country code whereas the "X" prefix is reserved for special, non-country-specific currencies. Interestingly, XBT would be the first code to have more than 3 digits to the right of the decimal separator (most have only two). The Bitcoin protocol was intentionally launched with 8 digits to the right of the decimal separator, because rather than inflate the supply to create more units, the decentralized Bitcoin protocol subdivides to obtain more units. And, even the convention of eight spaces could be expanded through a majority consensus of the bitcoin mining operators, who secure the transactions on the decentralized Bitcoin payments network. The global network of retail and wholesale foreign exchange dealers relies on the ISO 4217 code system. A robust spot market for bitcoin requires broad integration of bitcoin as a unit within existing electronic trading platforms. Platform market leaders like MetaTrader 4 would be driven to incorporate XBT into their standard product offering paving the way for a multitude of currency pairs involving bitcoin (XBT/USD for the dollar, XBT/EUR for the euro, and so on). The market depth and liquidity of this robust spot market is what would eventually underpin a derivatives market for bitcoin futures contracts and options. Without a deep spot market, there is no credible and reliable method to offset risk in derivative positions, which otherwise place too much emphasis on pure counterparty risk. Free market derivatives exchanges with sufficient and verifiable inventories evolve to manage the trade clearing and settlement process. At that point, the jurisdictional race would be on for becoming the domicile with the world's deepest bitcoin futures exchange. While not apparent at first, the significance of this XBT milestone would have a lasting impact on Bitcoin and its role in the global monetary system. No other non-State digital currency has ever achieved bitcoin's level of market penetration and overall market capitalization ($1.2 billion as of Aug. 19), which is even more remarkable considering that bitcoin is barely four-and-a-half years old.